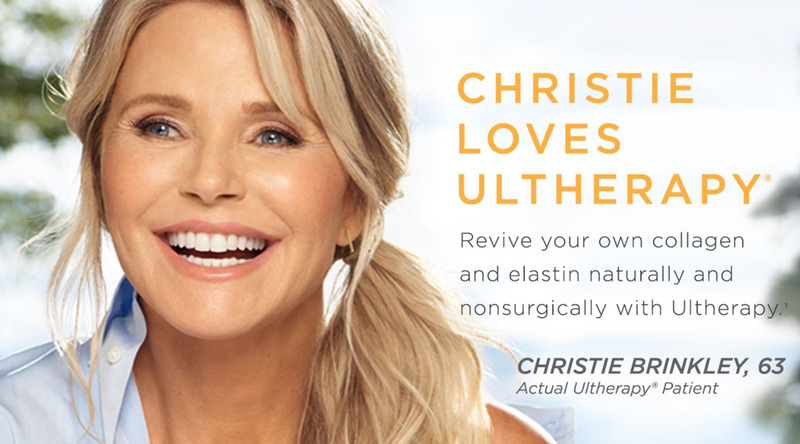 Christie Brinkley renowned supermodel, loves Ultherapy! Christie Brinkley has always shared her beauty secrets, so it was only expected that she share her beauty experience with Ultherapy. At one time Christie noticed creases appearing on her décolleté, so she decided to give Ultherapy a try after watching Kathie Lee Gifford demonstrate it on the Today show. She has never looked back. Christie Brinkley feels that her results happened gradually yet are noticeable, and very natural. This non-invasive, non-surgical Ultherapy procedure, is FDA-cleared to lift skin on the neck, brow and under the chin. Ultherapy also helps to improve lines and wrinkles on the decolletage, by stimulating your body’s own collagen and elastin. Ultherapy is the only cosmetic procedure that uses ultrasound imaging. This allows your practitioner to visualize and deliver energy into the appropriate layers of tissue that require lifting and tightening. Ultherapy has been voted the best skin-tightening treatment 4 years in a row by New Beauty!